Windows Live Mail backup is a method of keeping the content of Windows Mail accounts intact. Since 2016, Windows Live Mail migrates to Outlook.com, although Handy Backup still provides Windows Live Mail backup and restore. 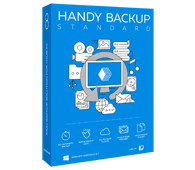 Handy Backup makes every Windows Live Mail backup automatically, requiring no interruption by user after creating a scheduled backup task and establishing initial connection with a new Windows Live Mail IMAP server. Still, you can backup Windows Mail by starting a task manually when you want. You can keep your backup where you want, e.g. 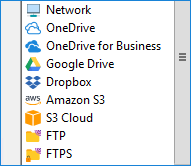 backup Windows Live Mail to Dropbox, to a local folder or to your NAS. Feel free with keeping backups in native EML message formats to every modern type of storage existed, including local, network and cloud storage units and services! Move your Windows Live Mail backup to another server, or just create a new folder containing copies of selected messages from your contacts. Using Handy Backup as Windows Live Mail backup tool, you can restore your message copies to any place allowing IMAP settings for Live Mail or other webmail services. Notifying users by email about task status, as well as reporting and logging all backup activities. The Standard edition allows Windows Live Mail backup and restore, using the IMAP connection for accessing data on Outlook.com. It supports all the most popular storages and vaults for backups. Free 30-days trial version! How to Backup Windows Live Mail Accounts, Contacts and Messages with Handy Backup? For now, Windows Live Mail backup is just a part of Outlook.com backup procedure! Let us explain it for you in some details. To create an automatic backup task, please follow the next instruction. Open Handy Backup. 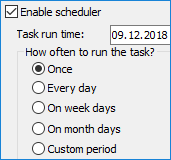 Create a new task by a button on the main panel, a menu or Ctrl+N. On the Step 1, select a backup task. Go to the Step 2. Select the “Email” plug-in from the “Email” group. This plug-in uses IMAP for Windows Live Mail. 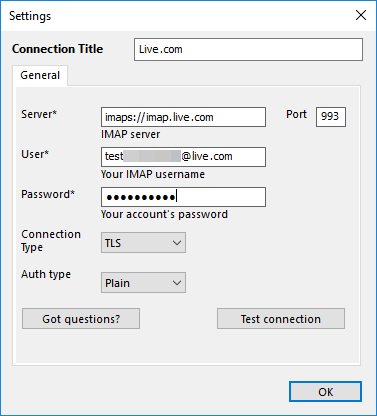 On the new configuration dialog, enter the IMAP settings for Windows Live Mail. Note: Do not forget to relocate and change IMAP server settings for Live Mail to a new server containing these data! For now, the Windows Live Mail IMAP server uses the parameters for its new location! 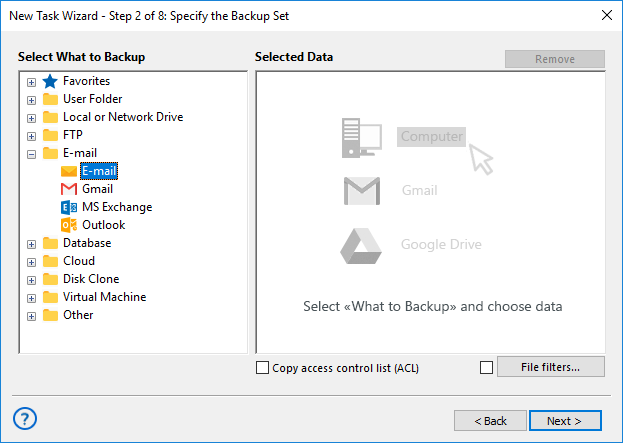 Click OK. You will see the list of your Windows Live Mail emails and folders for backup. Check/uncheck data you want to back up or to exclude these data from the backup set. When you finish selecting, click OK and return to the Step 2 of the task creation wizard. Continue creating a task as described in the User Manual. All other steps are unspecific for utilizing Live Mail IMAP settings for backup. Just as described for creating a Windows Live Mail backup task, create a restoration task on the Step 1. Then select a file backup.hbi from your backup location. This file contains all the data about your backup, including the default place for restoring your Windows Live Mail emails. For restoring data to an original location, just continue creating a task. For cloning your Windows Mail to a different message folder, click “Change location”. In latter case, you will see a dialog for selecting a new data location. Note that you must have a connection to a new IMAP mail server to utilize this function of Windows Live Mail backup software. 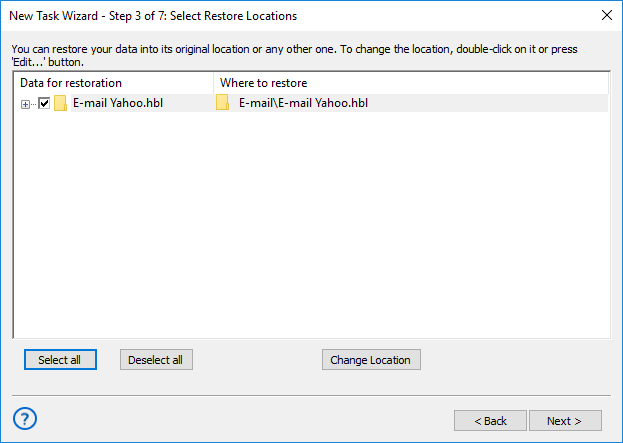 After selecting a new location, create a folder for restored data if you need it, and click OK. Note: Excepting the migration for freshly created accounts, we are recommending always moving your Windows Live Mail backup data to another folder than actual messages existed in the destination account. This may be crucial for preserving data from an accidental loss. with a full set of functions and features unlocked!